In the Magic Kingdom at Walt Disney World Resort, Space Mountain is one of the FastPass eligible rides. In the past, to get a Space Mountain FastPass you would have to go up to the FastPass Distribution area, that was to the left of the Space Mountain entrance, and put your ticket into the FastPass ticket machines to get a FastPass ticket for the ride. Disney had this original FastPass program setup at Walt Disney World for many of the popular attractions. The FastPass program has been replaced by Disney's all electronic FastPass+ program (“FastPass Plus”). 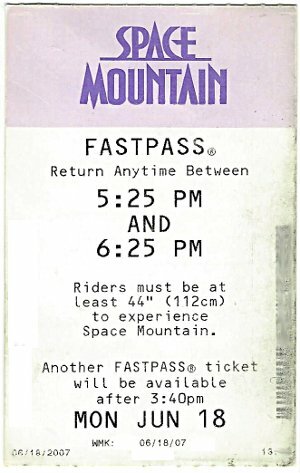 Disneyland in California still has the original FastPass program and the Space Mountain attraction in Disneyland still has the old FastPass setup. To get a FastPass+ electronic ticket for Space Mountain in Walt Disney World you have to make a reservation through My Disney Experience on the disneyworld.disney.go.com website, through the mobile apps, in the parks at the FastPass+ kiosks, or with a cast member. The FastPass+ kiosks that are closest to the ride are at the main entrance to Tomorrowland (from the center of the park). A FastPass+ electronic ticket or reservation will allow you to “skip” the regular standby line and move to the front of the line through Space Mountain’s dedicated FastPass+ line. Wait times for the FastPass plus line are usually under 10 or 15 minutes. Above Space Mountain FastPass+ Entrance photo originally by arctic_whirlwind on Flickr. Modified by NavFile. Photo released under a Creative Commons License. Space Mountain is one of the best rides in the Magic Kingdom to get a FastPass+ for. Space Mountain is one of the popular rides in the park and wait times for the standby line can be rather long at times (45 to 90 minutes). Information on how to get a FastPass+ for the indoor roller coaster and some tips on how to get better FastPass+ times are listed below. Once you setup your MyDisneyExperience account, your tickets are linked to your account. You can then make FastPass+ reservations. Once you have selected a FastPass+ for Space Mountain, the FastPass will be stored/linked to your ticket or MagicBand. When your time slot is active, you can go to Space Mountain and enter the FastPass+ entrance line. There you will “scan”, actually hold next to the ticket reader, your ticket or MagicBand to enter the ride. Choose the earliest time slots. As part of the FastPass+ program, you get a total of 3 FastPass+ reservations per ticket to start off with. Once you use the three reservations or the 3 time slots pass, you can make additional reservations. After the three reservations are used, you get one additional FastPass. Once you use that FastPass+ reservation, you get an additional one and so on. Go back into your MyDisneyExperience account to re-select times. Walt Disney World will automatically give you time slot choices based on the rides you select. The shown selections may not be the times that you like. After making the selections for FastPass+, you can go back into your account and select other time slots for each ride, individually. You may then be able to select time slots that were not shown to you on the first selection screen. As mentioned in tip #1, selecting the earliest times is the best option. By selecting the earliest times, you will have time to get additional FastPasses latter on. 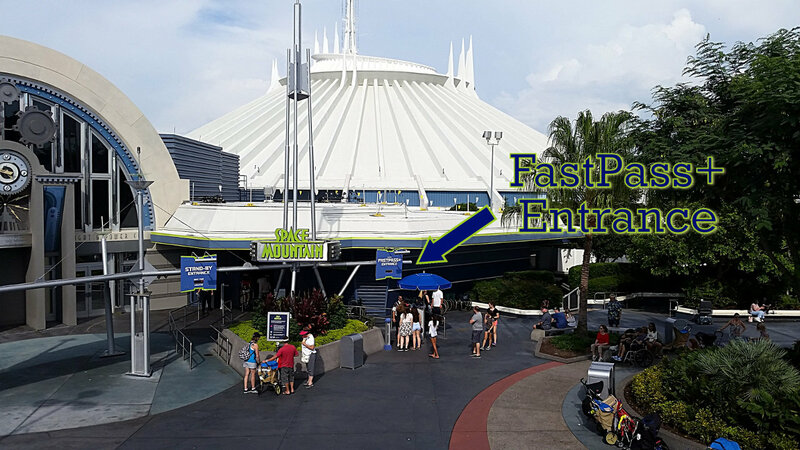 Make FastPass + reservations for popular rides, like Space Mountain, and rides that your party wants to ride on. FastPass+ reservations will almost ensure that you are able to ride on your selected attractions during your time at the park. You can learn more about Space Mountain by visiting the other pages we have here on the site.